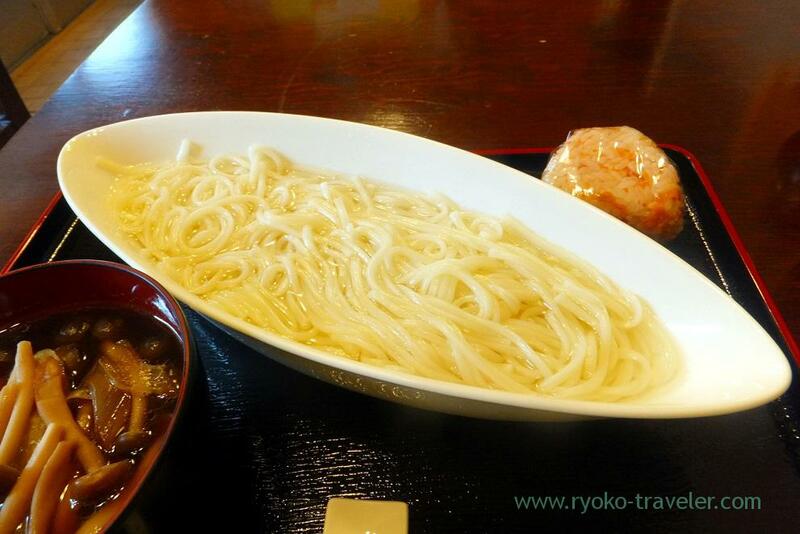 One of the few restaurant serving Goto-style udon in Tokyo. 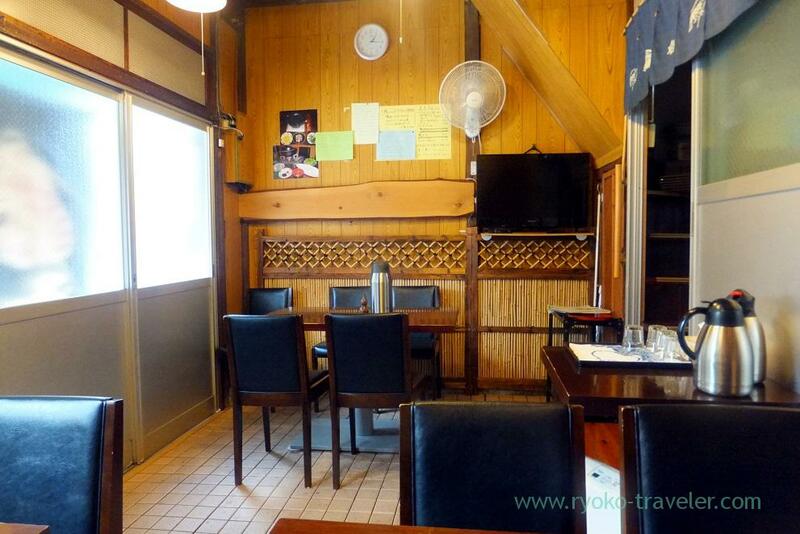 I heard that there’s a shop that is a specialty shop of “Goto-style udon”, a little far from Kachidoki station. So, I tried the shop at lunchtime. It’s not too far from the station, but there’s no restaurants and shops near the shop. It stand within residential area. At first I passed through in front of this house. Its looking is far from restaurant. 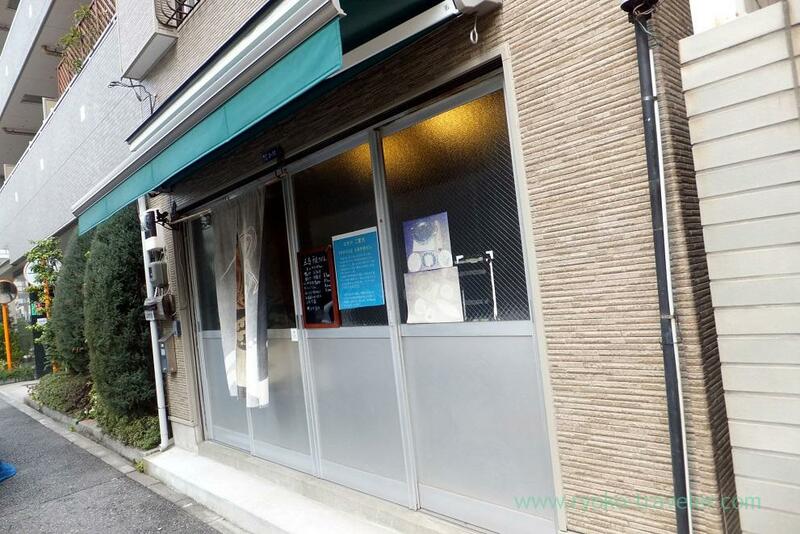 It’s like something working space in Tsukiji market :p There’s no shop name ! 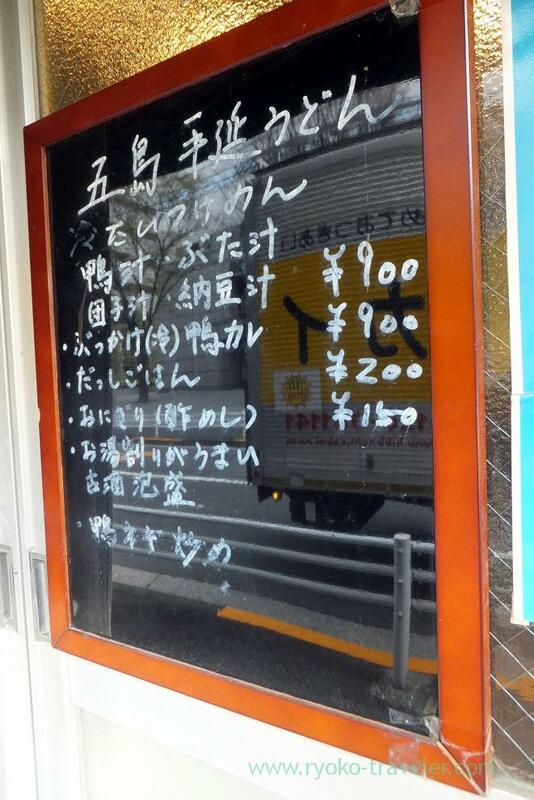 Only this blackboard menu says they are udon restaurant and they are open ! I found it is Goto-style udon shop indeed. Soup can be chosen from duck meat, pork meat, meat ball and natto. Though I hesitated to enter the shop, I opened the door. But no one was there. No sounds. I said “excuse me !” to the upstairs. And the elder man appeared and took my order. He seemed to be surprised at me lunch break near the offices was already end. 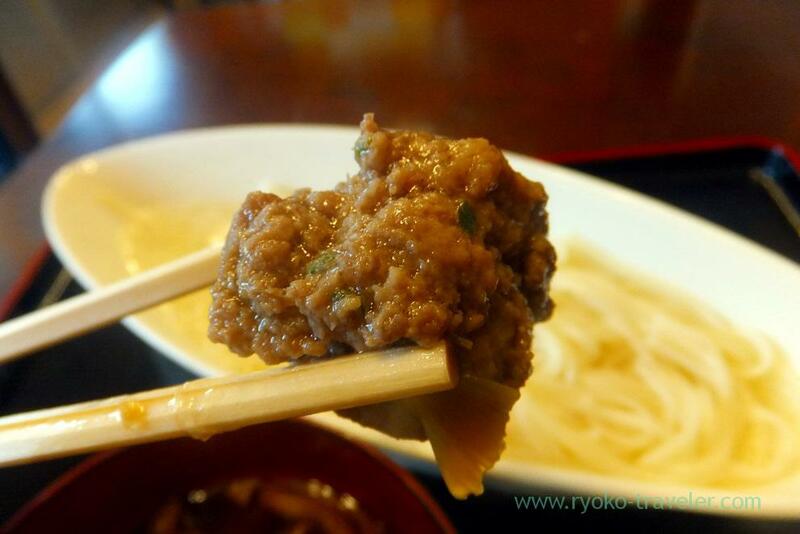 I ordered meat ball udon (団子汁うどん, 900 yen)/b>. My lunch was served in 10 minutes. Originating in China, Goto-style udon is said to have been introduced to Japan in the Nara Period via an envoy dispatched to Tang Dynasty China. So, it is said to be the origin of udon. But there aren’t many restaurants that serve Goto-style udon and many people even don’t know the existence of Goto-style udon. I didn’t know, too. 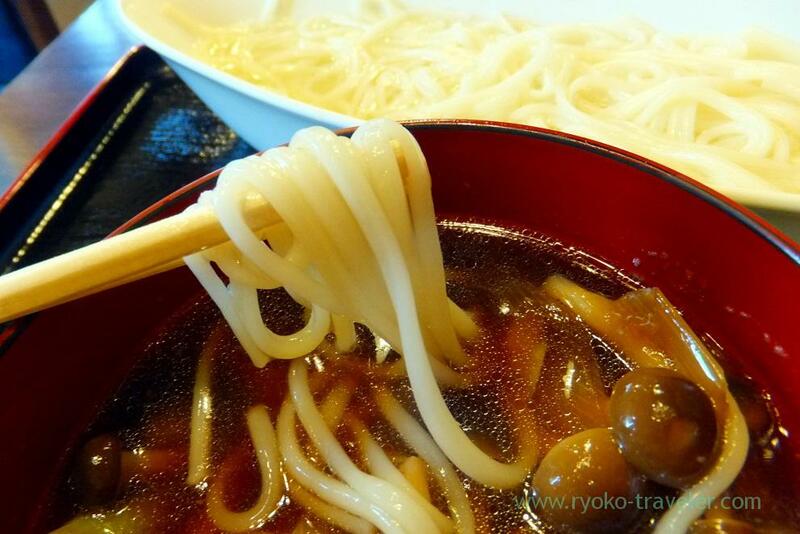 Goto-style udon is hand-streched thin and round-shaped noodles (Tenobe udon = 手延べうどん). It is produced in Goto island of Nagasaki prefecture. It have soft and springy texture. The meat ball soup had much mushrooms in the miso soup bowl ! The soup is made of Hidaka konbu seaweed, dried bonito and dried shiitake mushroom. Of course, duck meat balls were in it ! 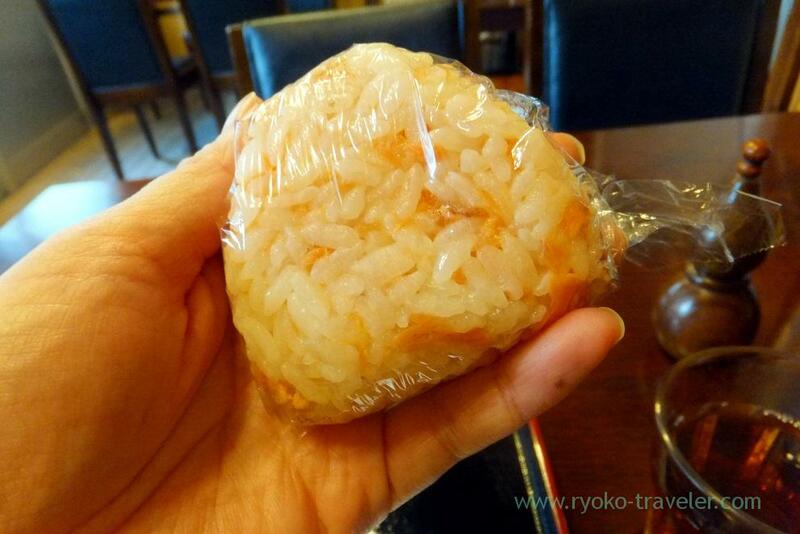 By the way, all udon have one onigiri from some flavors. I chose vinegared salmon. There were only two flavor left when I visited there. But they prepare much flavors at busy time. 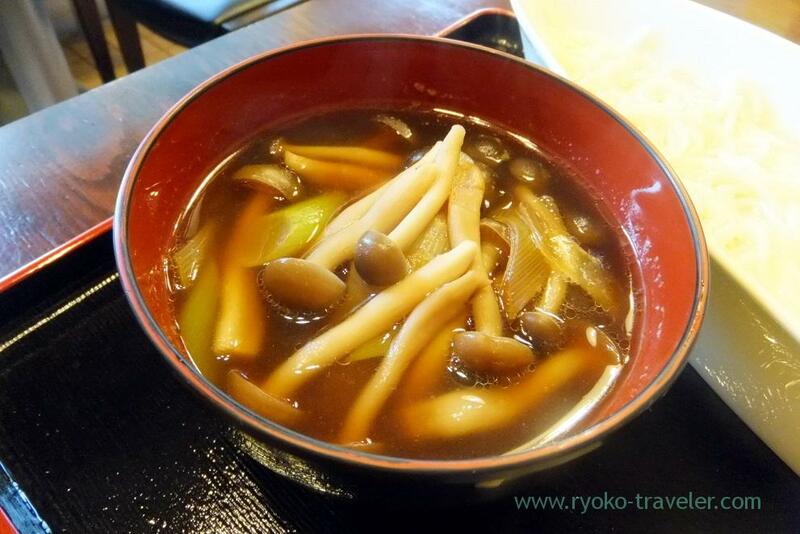 Goto-style udon was similar to somen (素麺) as its texture and feeling of the udon going down. Its refreshing taste is good for muggy summer just now !